Parkinson’s disease (PD) is characterized by the triad of rest tremor, rigidity (muscle stiffness) and akinesia (reduction of speed and of amplitude of movements of any body part, up to movement suppression). Pain, dystonia and motor overactivity called chorea (or dyskinesias) can also be part of the clinical picture. The loss of nigral dopaminergic cells causes a chain reaction through the basal ganglia at the source of an overactivity of the thalamus and cortex, leading to the mentioned symptoms. Our approach centers on an interruption of the pallido-thalamic pathway without touching the thalamus. This allows the coupling of efficiency and sparing of brain functions, and thus if necessary a symptom relief on both sides. Where to go to provide an efficient and sparing effect against all parkinsonian symptoms relates to years of work, in our case more than 20 years, of study of the disease mechanisms and their most adequate control thanks to consequent selection of brain targets. The good news is: we can provide symptom relief without reducing motor, sensory and cognitive functions, and without risk to increase the symptom mechanisms. We can apply this treatment on both sides of the brain if necessary. The long term efficiency of the treatment stands at 60 – 70% mean relief of all Parkinson symptoms, with a stability documented over 5 years in one of our studies (and seen over longer periods of years in many of our patients poststudy). There is a low risk profile, mainly comprising a bleeding risk in the target, which can be estimated at less than 1%. The risk of collateral damage to structures around the target is significantly reduced by the real-time monitoring of the thermal work, the absence of mechanical brain shift and a targeting accuracy of half a millimeter. 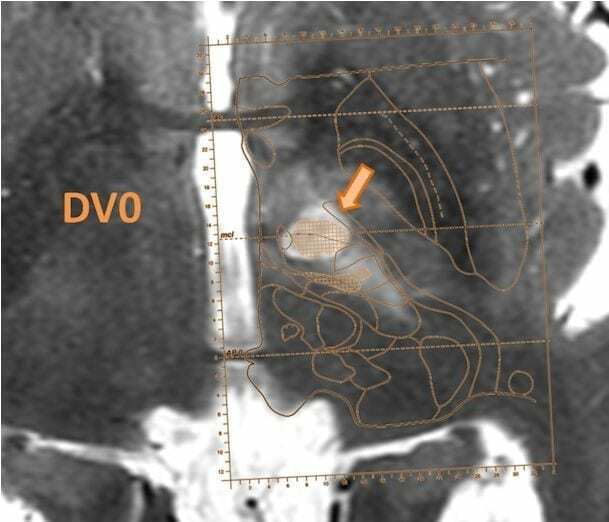 Long term negative effects of the ultrasound lesioning process can be excluded thanks to the fact that it is a thermocoagulation, the long term innocuity of which has been demonstrated by more than 60 years of functional neurosurgical activity using radiofrequency thermocoagulation. Long term results of the focused ultrasound treatments are not yet available. However, as the targets we use are exactly the same as the ones we have developed and used over more than 20 years using the electrode penetration technique with radiofrequency , the same long term results can be expected for all our ultrasound treatments, a fact already confirmed by our one-year results with focused ultrasound. Dopamine production in the substantia nigra (in blue) is reduced and causes variations of the function of the striatum (in dark green) and a global overactivity in the pallidum (in light green). The pallido-thalamic tract, the target of our intervention called pallido-thalamic tractotomy (PTT) , projects to the thalamus. This one has rich interconnections with the cortex (thalamo-cortico-thalamic loops). The output of the cortex is the corticospinal tract projecting to the spinal cord. 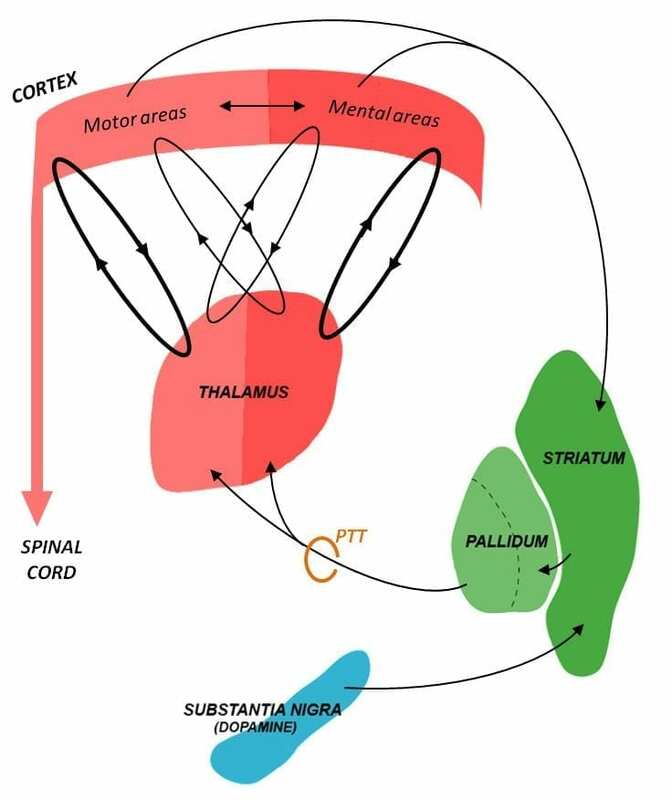 The overactive pallido-thalamic tract causes the sequential increase of low and then high frequency thalamo-cortical activities, at the source of the different symptoms of Parkinson’s disease. The PTT liberates the thalamo-cortical partners from a useless and disturbing overinhibition from the pallidum. For more informations, read « Some Unclassical Considerations On PD ». Axial MR image of the thalamus and subthalamus, displaying a pallidothalamic tractotomy, the treatment for Parkinson’s disease, with atlas overlay.